Monitor and manage performance for a site, an entire portfolio of sites, and site devices with Trimark’s SCADA. Trimark married advanced SCADA functions with intuitive analytical tools to meet both operational and business needs of resource owners, operators, and maintenance teams. Utility-scale solar resources are complex and generate large amounts of data. The equipment at these sites create thousands of data points. Actions require immediate analysis and response. 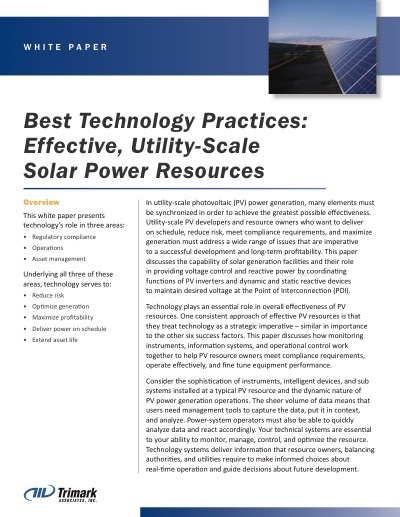 To address the unique challenges to maximize PV power generation, a SCADA system with precise monitoring and detailed analysis capabilities is needed. 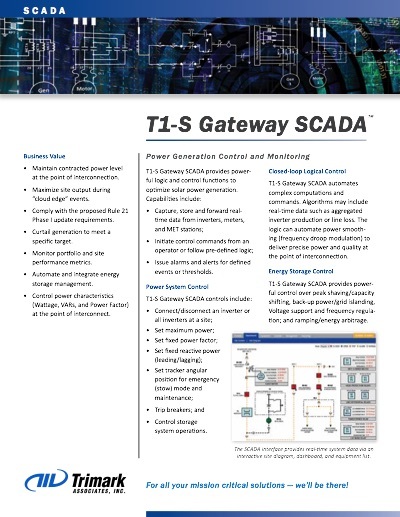 From reporting to forecasting, Trimark provides a complete utility-scale SCADA system, including measurement, automation, logic, and performance management. It’s exactly what you need to maximize uptime, meet revenue commitments, optimize asset life, and fine tune performance. Trimark’s SCADA solution combines intelligent automation, real-time control and a highly intuitive user interface. SCADA lets you reach across your entire portfolio or down to any device at any site. You can manage your system from a web browser or even a mobile app using Trimark Vantage, our intuitive user interface. You can also let the system automate routine actions, process external commands, and deliver exact power values at the point of interconnection. Trimark Associates ranked #1 worldwide for utility-scale solar monitoring at 170 plants producing 6.5 GW of power. Trimark’s SCADA system enables real time monitoring and pinpoint control, along with customizable reports that are used to analyze and optimize performance. 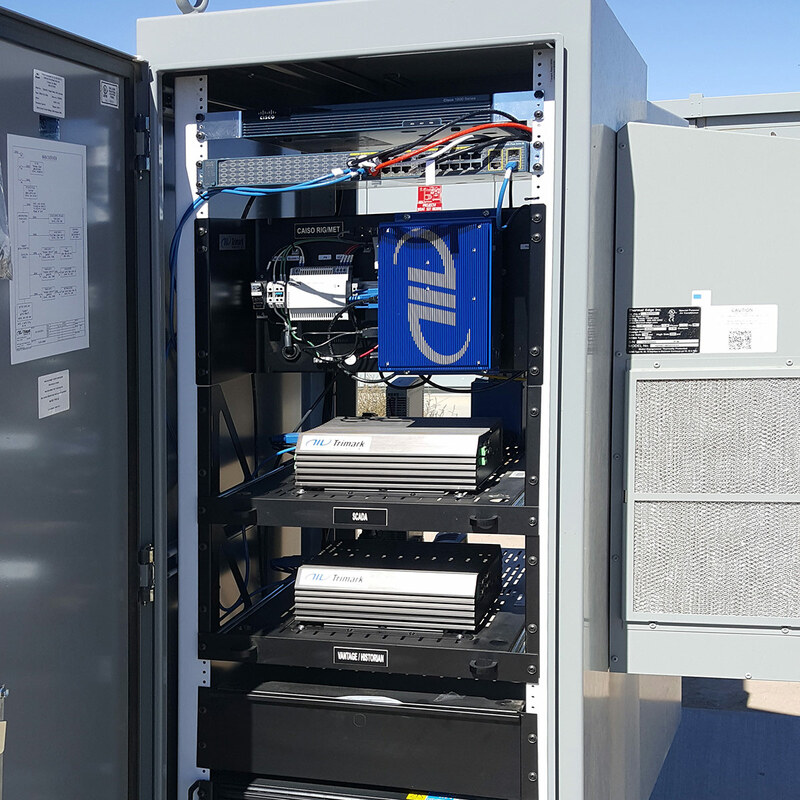 The system monitors and controls a variety of devices at utility-scale sites, such as inverters, meters, trackers, meteorological stations, sensors, and other smart devices. The data from these devices is used to highlight deficient performance and point out the need for maintenance activities. We continually work to evolve our system to meet our clients’ needs. Our ongoing advancements illustrate how powerful a SCADA system can be to ensure solar power plants operate and perform as intended. All of these features can be managed via local, remote, and mobile access. Trimark’s SCADA system was developed and designed in-house, adding value, functionality, innovative features, and customizable configurations to match each client’s specific requirements. Our engineering team works with inverter manufacturers to develop data libraries needed to collect performance data. Then we collaborate with the performance management team to automate the analytics that boost revenues. Ongoing upgrades and product innovations are the norm, integrating advanced controls and analytic features that result in improved performance. It’s a pleasure working with the Trimark team. Their depth of knowledge with all stakeholders in the solar industry is unparalleled. I’m also very impressed by their interactions with our utility offtaker clients. They clearly see the value in both subject matter expertise and customer service. You don’t need to be an engineer to use Trimark Vantage User Interface. It’s built to look and feel like a business tool. Trimark married advanced SCADA functions with intuitive analytical tools to meet both OPERATIONAL AND BUSINESS needs of resource owners, operators, and maintenance teams. 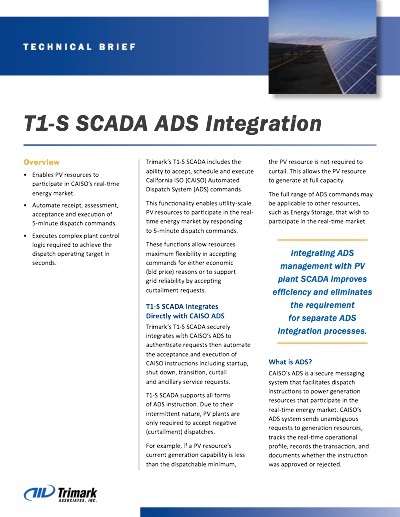 Trimark’s metering, RIG, and SCADA products and services are used in large-scale PV facilities: Topaz Solar Farm (550MW), Solar Star (579MW), and Desert Sunlight (550MW). Developed, owned, and operated by Sustainable Power Group (sPower), this site is a 3MW 12kV site that directly ties into the local distribution line. 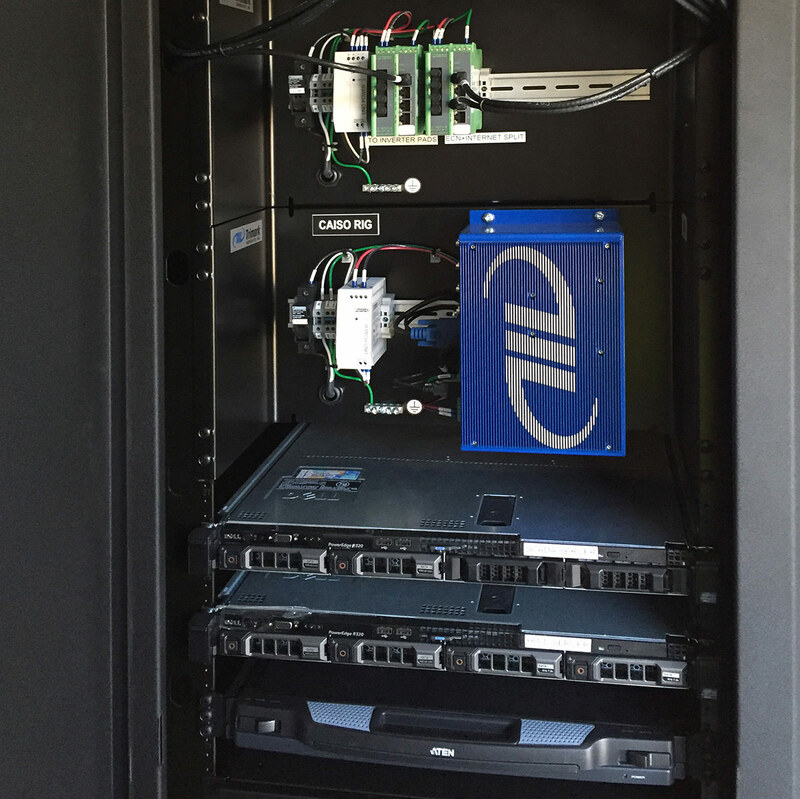 Featuring an outdoor enclosure configuration, this project features a fully self-contained, climate controlled SCADA enclosure with more than 8 hours of backup run time, 2 Solectria SGI750TM and a NEXTracker tracking system. Rosendin Electric, Inc. was the EPC responsible for managing construction. 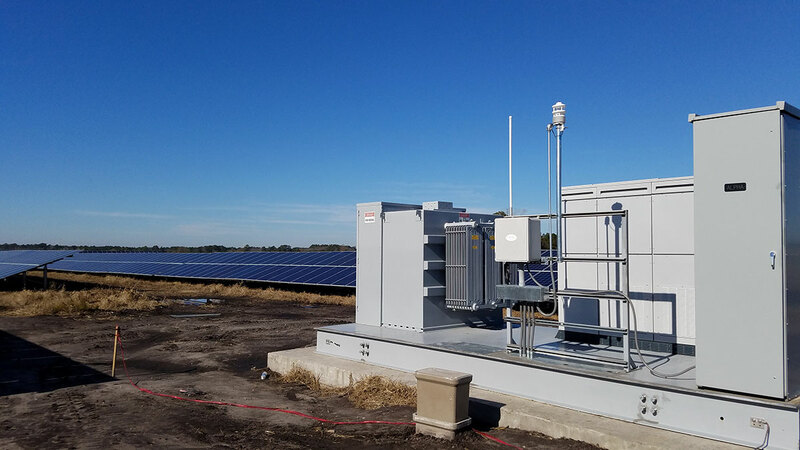 Trimark was contracted to deliver a fully functional PV SCADA system, revenue metering, and meteorological stations to manage the site, maximize profitability, and generate next level production analytics. The Garland Solar project is owned by Southern Power and Recurrent Energy. 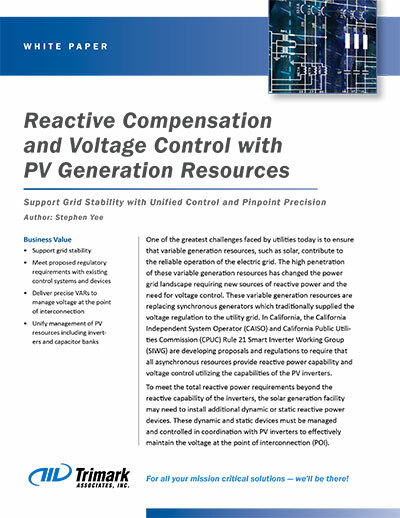 Trimark provided an integrated solution for PV control, compliance, and accurate settlements. Developed, owned, and operated by Sustainable Power Group (sPower), these sites included at total of 21 Power Electronic 2330kW inverters, and an ATI V3.0 tracking system. 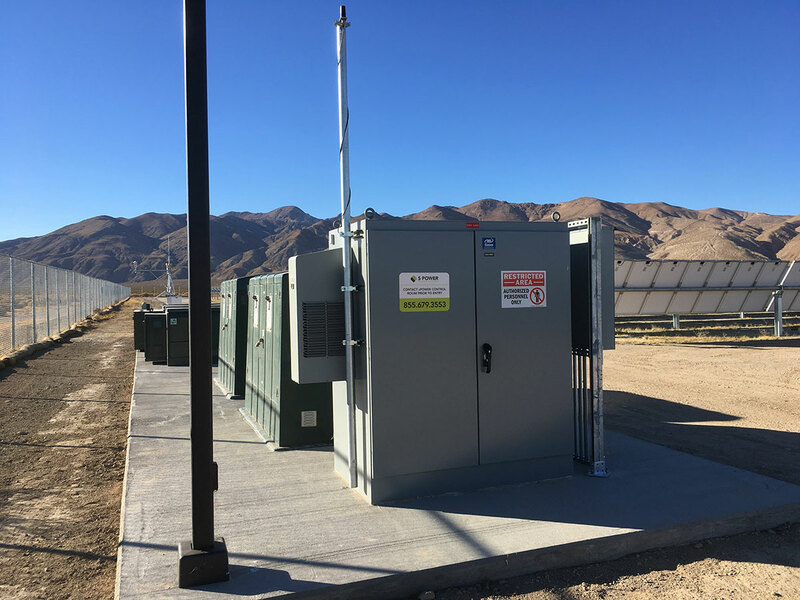 As part of the Big Sky Substation to aggregation of renewable resources, these sites were included in the Master Plant Controller to provide a central source of voltage and VAR regulation to support greater grid stability. The Bayshore sites became the 6th, 7th, and 8th additions to the Big Sky Substation. Signal Energy was the EPC responsible for managing construction. Trimark was given the responsibility to establish power regulation through its SCADA platform and integrate it with the Big Sky Substation Master Plant Controller for further grid stability support. "In a year-end situation where you have to be online, things can be panicked. Trimark just jumps and says, we can get this done."